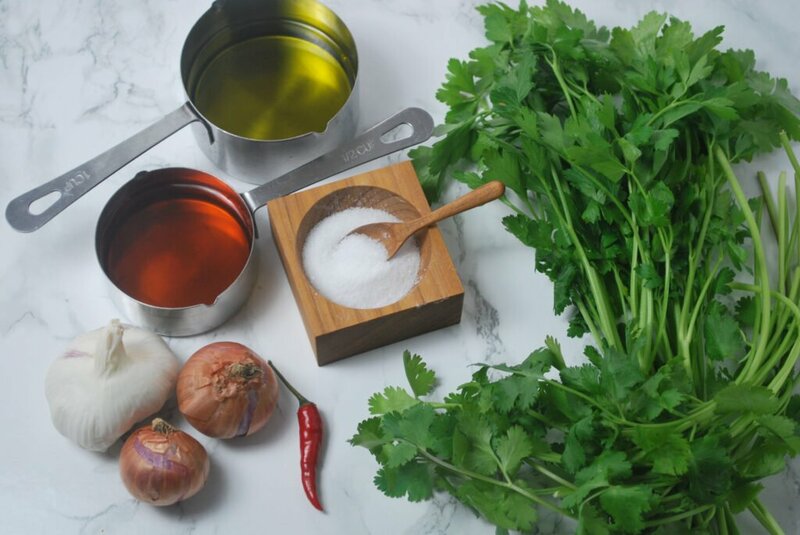 This easy chimichurri sauce is zesty and full of fresh parsley and cilantro with a hint or garlic and chili. 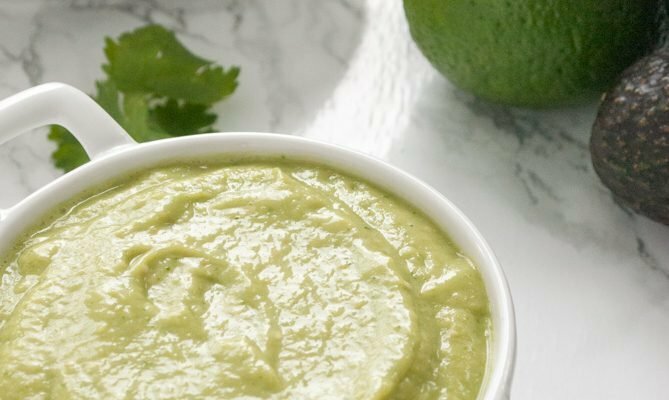 It’s great used as a sauce for grilled vegetables or seafood! 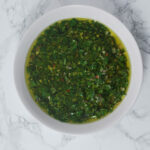 Traditionally, chimichurri sauce is an uncooked sauce of fresh herbs, garlic, oil and red wine vinegar that is served with grilled meat, but you can use it to flavour anything. If you’ve never had it before, it’s an absolutely delicious blend of fresh minced herbs with a bit of tang. 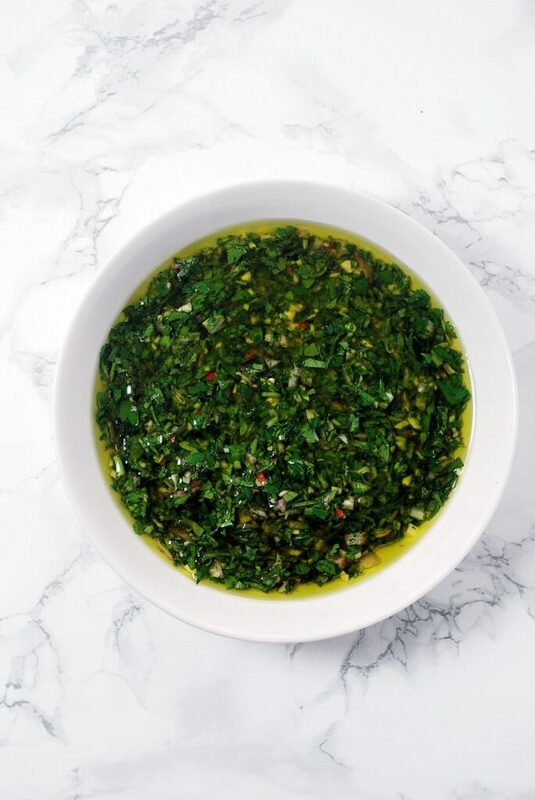 I’m not going to lie, there is a lot of mincing and chopping that goes into preparing chimichurri sauce, so be prepared for a bit of work – but believe me, your efforts will be rewarded! And then the chopping begins! 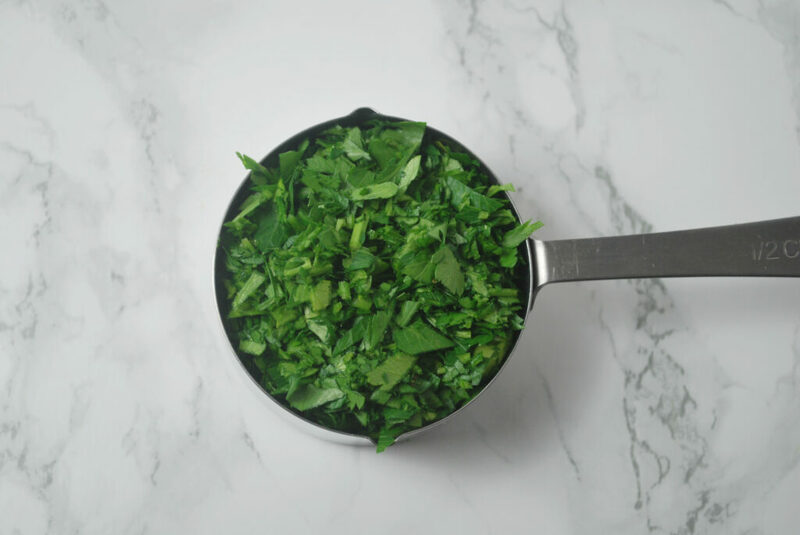 There is no need to pluck off the leaves from the stems of the parsley and cilantro – I just cut the bunch about halfway up from the bottom, discard the part that is all stems and then mince away. For the chilli, if you like things on the spicier side you can include the seeds (like I did), but if you like things milder remove the seeds before mincing, and make sure to wash your hands thoroughly after handling the pepper! I have learned the hard way that the oils from hot peppers stick to your skin and can burn if you touch places like your eyes or nose after handling them. After you have chopped up the herbs, garlic, red chilli, and shallot you simply mix them together in a medium sized bowl. 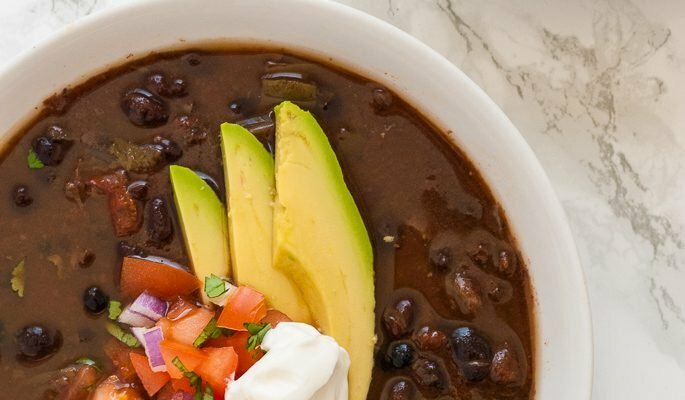 This recipe yields about a cup and a half of sauce. 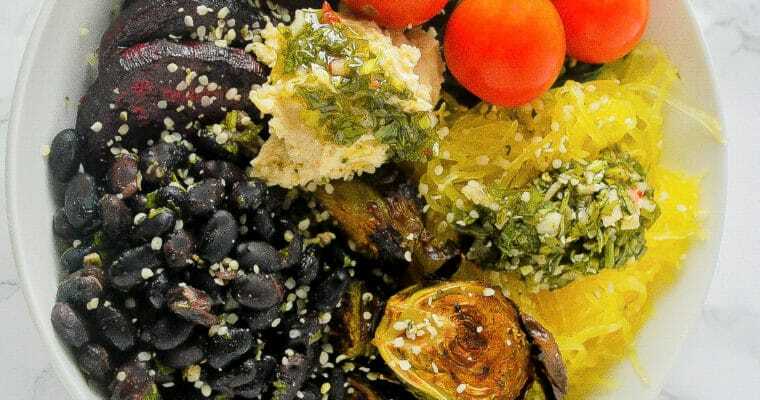 You can store it in an airtight container for a week or two in your fridge. 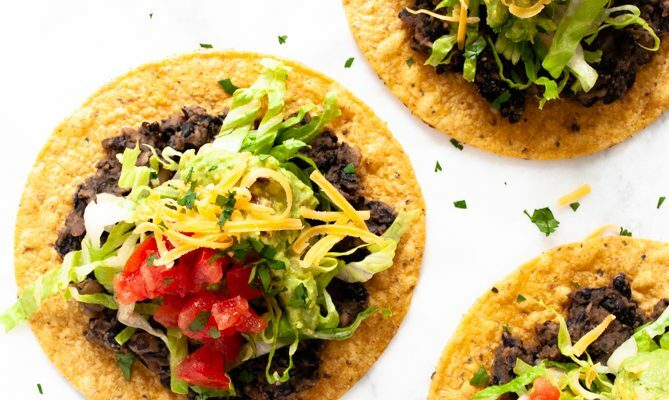 One thing to note is that olive oil solidifies in the fridge – this is nothing to worry about, but you will want to remove the sauce from the fridge and allow it time to return to room temperature before you use. This sauce (like many others) also does well in the freezer. We like to take an empty ice cube tray and portion the sauce in the cubes of the tray and then freeze. After the sauce has frozen, you can remove the cubes from the tray and store in a freezer bag. Then you can just pull out a cube whenever you would like to use fresh chimichurri. In upcoming posts this week, I am going to show you a couple of different ways that we like to incorporate chimichurri sauce into our meals! Mince the parsley until you have enough to make up 1/2 cup and do the same with the cilantro. Add the minced herbs to a medium sized bowl. Mince the shallot and garlic cloves and add to the bowl. Slice the chilli in half lengthwise. If you prefer a milder spice to the sauce, remove the seeds before mincing. If you like it spicier, leave the seeds in. Add the minced chilli to the bowl. Add the remaining ingredients to the bowl and whisk until thoroughly mixed.